The restaurant Hacienda Comida Y Cocteles is already well-known for serving authentic Mexican comfort food in Bonifacio Global City. Located along Forbes Town Road, Hacienda is co-owned by couple Steve and Liza Tan Mills who, after a vacation at Mexico, became inspired to bring the authentic texture and strong taste of Mexican food to the country. Their tacos were one of the first dishes that became popular in the area, earning Hacienda frequent weekend customers which included Juana Yupangco, the woman behind Mesa ni Misis. Upon finding out that Mesa ni Misis works with restaurants to promote healthy ways of cooking using sustainable food sources, owners of Hacienda decided to collaborate with Yupangco. This led to the creation of Hacienda’s own vegetarian tacos. 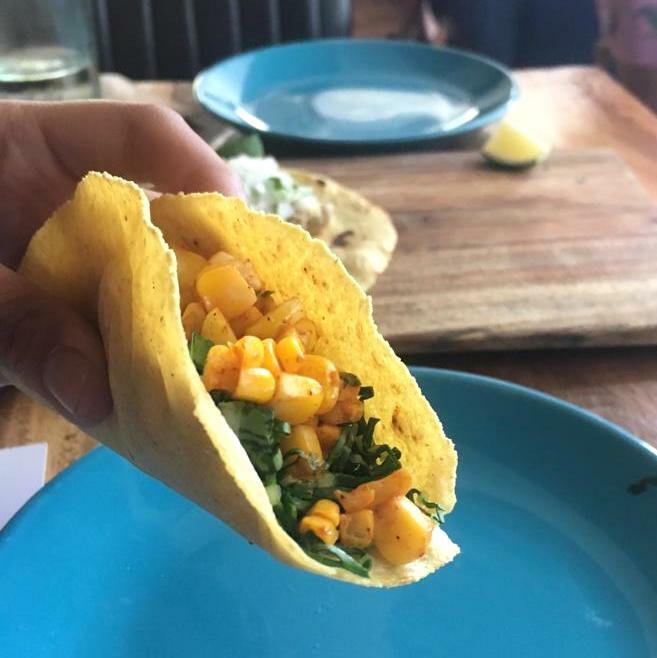 Served on the restaurant’s signature gluten-free and hand-pressed soft corn tortilla, the tacos are fitting for any kind of palate. She also decided to make a vegetarian version of the restaurant’s carnitas tacos. Instead of slow-braised shredded pork, Yupangco used langka to top the taco aptly named Same Same but Different. She then added the other ingredients in carnitas. Taste both the meat and vegetarian version, you wouldn’t point out much difference. The third taco is called Ready, Get Seta, Go and it’s a smooth melange of sautéed oyster mushrooms, cilantro, and steak salsa. This recipe was made in collaboration with Hacienda’s own chef. All ingredients used in making the vegetarian tacos were sourced locally and sustainably. We don’t know when or if we will be able to taste the other two that didn’t make the cut, but we are certain that this won’t be the last addition to Hacienda’s growing Mexican and vegetarian menu.